What are Lovehoney's delivery costs and options? We do everything we can to make sure your order is delivered on time and in plain packaging. Lovehoney uses a variety of postal and courier services to ensure smooth delivery. For fast courier delivery to Ireland, place your order before 2.15pm UK time Monday to Friday for same-day dispatch. For fast delivery to France and Germany, place your order before 3.15pm CET Monday to Friday for same-day dispatch. Orders on Air Mail and International Tracked Services services placed before 6pm CET Monday to Friday are dispatched the same day. Air Mail and Tracked orders placed before 2pm on Saturday are dispatched on the same day. All items are in stock for same day dispatch. You'll be told when you order when your package will be sent. We offer free returns up to 30 days after purchase and a 1 year product guarantee. Learn more about our Returns policy on our Returns & Refunds page. Lovehoney delivers to the following countries: Please note that orders placed for delivery to countries other than these will be cancelled. Are you in Germany? 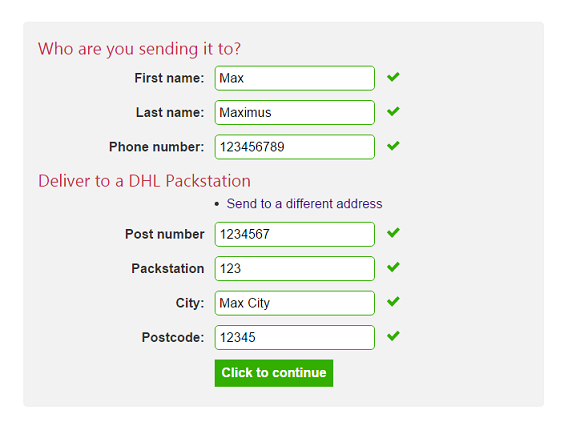 Then you can have your order sent to a DHL Packstation. Just select to have your order delivered to a DHL Packstation and fill in the form, including your Postnummer and the Packstation ID as seen below.